This is just some examples of the ATVFiles XML metadata format. I claim no accuracy of the data in the examples. The "type" attribute on the media tag can be one of the following values: "TV Show", "Song", "Music Video", "Podcast", "Movie", and "Audio Book". The default value is "Movie". That attribute determines the information shown on the left-hand side of the screen. The duration tag will bypass the normal QuickTime-based scanning for file duration. It is specified in seconds. Most of the other tags should be self explainatory. The primary attribute on the genre tag sets the "primary" genre, which is the one shown in the metadata. to find out if Sam is Nick's son or not. Classic, Drama, Sports, Teen, Reality TV, Nonfiction, Kids, Sci-Fi & Fantasy, Action & Adventure, Comedy. MediaGrabber - A PHP based script to assist in not only XML data but cover art as well. 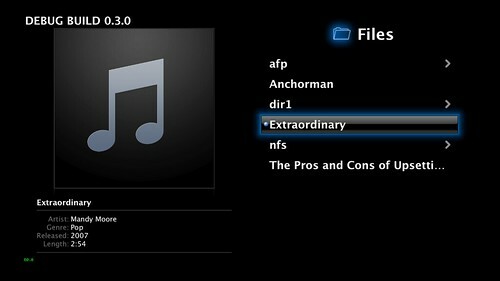 AppleTV Datamaker Mac OS X based application to generate metadata and cover art for ATVFiles, open source. ATVFiles Movie/TV Categorization Script - A Perl script that takes a video file of a Movie or TV show and attempt to download information about such file and put the information into the ATVFiles XML Metadata. This page was last edited on 11 March 2010, at 12:27.